We have over 20 years of fine foods tradition developed carefully and with loving attention to details. We listen to our guests to refine our offerings and menus constantly. Born from and firmly rooted in the local culture and customs, the Velan tradition draws on the local values of entrepreneurship and gracious hospitality. At Velan you will find these values in our menus, our service, and our total presentation. 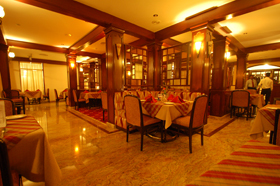 Uthara Restaurant provides the same quality of food and service as at Velan Hotel Greenfields. Our expert Chefs are cross-trained and work both at Velan Hotel Greenfields and Uthara to ensure consistent quality and tastes. We are constantly innovating our menus and food offerings. The restaurant offers an executive buffet lunch and ala carte dinners – a range of carefully selected Indian, Continental, and Chinese dishes are featured on our ala carte menu.